The Ameghinornithidae include presumably flightless, or nearly so, birds with a convoluted taxonomic history. The taxon was first established for a species from an unknown horizon of the Quercy fissure fillings. This was classified as "Ameghinornis minor" by Mourer-Chauvire (1981), who assigned to it a humerus, two coracoids, and two carpometacarpi. The holotypic humerus of "A. minor" was originally described as "Strigogyps minor" by Gaillard (1939), who before (Gaillard 1908) named another species of Strigogyps, S. dubius, which was based on a distal tibio-tarsus. Gaillard (1908, 1939) compared these birds with extant Strigiformes and Accipitridae, but Mourer-Chauvire (1981) recognized the great similarity between the humerus of the Quercy species and that of the Phorusrhacidae. She considered "A. minor" to be an Old World representative of the Phorusrhacidae and the phylo-genetic affinities of S. dubius to be uncertain. synonym of S. dubius. 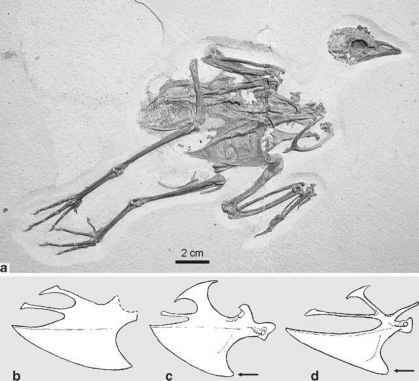 Peters (2007) accepted classification of Strigogyps, "Ameghinornis," and "Aenigmavis" into the Ameghinornithidae, but preferred their taxonomic separation, because the Quercy taxa are based on noncomparable skeletal elements. I do not concur with this conclusion (Mayr 2007f), and maintain allocation of the Quercy remains to a single species, S. dubius, to which these were also assigned by Mourer-Chauvire (2006). A further representative of Strigogyps with an equally confusing taxonomic history occurs in the middle Eocene of the Geisel Valley, in a slightly younger strati-graphic level than Messel (Mayr 2002a). This species is somewhat larger than S. sapea, but morphologically is very similar (Mayr 2007f). 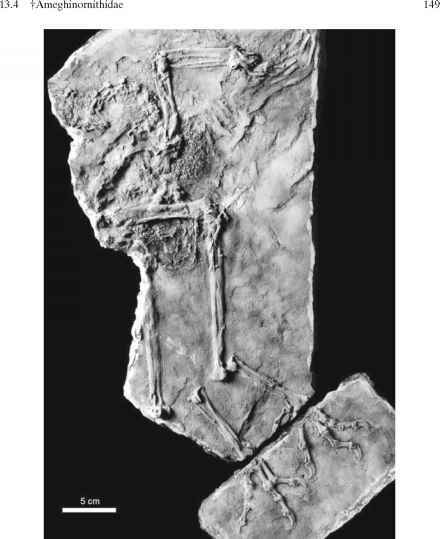 The only known specimen consists of two partial skeletons on separate slabs, which were studied by Lambrecht (1935). The slab with the wing and shoulder girdle elements was described as "Geiseloceros robustus" and compared with the Bucerotidae (hornbills) by Lambrecht (1935). The slab containing the pelvis and hindlimb elements, which was found 2 m away from that of the wing bones, formed the holotype of the putative New World vulture "Eocathartes robustus." Peter Houde (in Olson 1985) first assumed that "E. robustus" and "G. robustus" represent a single species, and Olson (1985) noted that probably neither was correctly identified. The morphology of these fossils perfectly matches the characteristic osteological features of Strigogyps sapea, and the species is now classified as Strigogyps robustus (Mayr 2007f). In summary, the Ameghinornithidae thus include three species, S. dubius (Quercy), S. sapea (Messel), and S. robustus (Geisel Valley). As yet undescribed remains of a species of Strigogyps were also found in the middle Eocene maar deposits of Eckfeld near Manscheid in Germany (own observation). The skull of Strigogyps is very poorly known, as only small fragments are preserved in the holotype of S. sapea. The wing skeleton is highly characteristic in that the ulna is much shorter than the humerus, whereas the hand skeleton is fairly long. The humerus has a very small proximal end, which together with the short ulna indicates flightlessness, or at least very weak flight capabilities. The wing is, however, not as greatly reduced as in phorusrhacids. The pelvis is further not as narrow as is in phorusrhacid birds and the hallux not as strongly reduced. In the holotype of S. sapea stomach content is preserved, and consists of plant matter. The robust coracoid and elongate carpometacarpus of S. sapea and S. robustus distinctly differ in their morphology from the corresponding bones, which were assigned to S. dubius ("A. minor") by Mourer-Chauvire (1981). These bones possibly belong to a flightless taxon of the Idiornithidae, such as the large Propelargus. Strigogyps can be shown to be outside a clade including the Idiornithidae, Phorusrhacidae, and Cariamidae, because the hypotarsus does not exhibit the presumably derived morphology found in the latter taxa, in which it is block-like and without any distinct sulci and crests (in Strigogyps there are two well-developed crests). Phorusrhacid affinities of Strigogyps (i.e., "Ameghinornis" and "Aenigmavis") were also doubted by Alvarenga and Höfling (2003), but its true phylogenetic relationships have not yet been positively established.